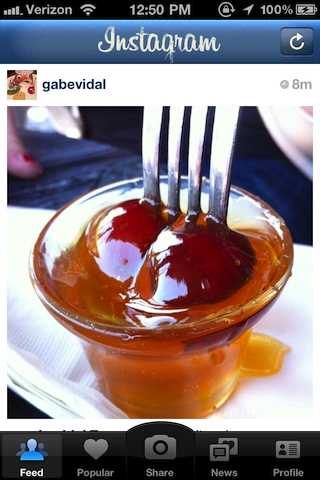 When we first previewed Instagram nine months ago, most of the initial comments predicted it would be dead on arrival. To say those people were wrong is a vast understatement. And Instagram now has five million ways to prove it. Yes, Instagram now has five million users. That’s 625,000 users for every month they’ve been in existence — with the growth accelerating. Just this past weekend they added 100,000 new users, for example. Even more amazing, there are now 1.25 million users for every one employee of Instagram. I got a chance to catch up with Instagram co-founder Kevin Systrom this morning to talk about the milestone and the bigger picture for the service. Beyond the five million user mark (which they actually hit yesterday), Instagram is about to hit another huge milestone: 100 million photos. They’re at 95 million right now, and they’re adding roughly 860,000 a day. In other words, by the end of this week, the total number of pictures should cross 100 million. For comparisons sake, it took Flickr two years to hit 100 million photos. Again, Instagram, just eight months. If you still had any doubts that a mobile photo revolution is happening, there you go. As for the burgeoning Instagram ecosystem, Systrom says that there are now 2,500 unique apps out there accessing their APIs. Remarkably, they are also seeing some 350,000 connections across their API, meaning that some of the apps connected are massively popular. Which are the most popular? Webstagram and Flipboard were the top two the last time he looked, Systrom says. There are also now applications pushing photos into Instagram — not through the API, but through more creative means. The emergence of Webstagram, which is a web-based viewer for Instagram photos, leads to the question of when Instagram might finally release their own web app? Systrom declined to comment on that, but did confirm that work continues in that area. As for the all-important Android question, same deal — nothing to share yet, but work continues. Systrom will say that the top priorities right now are to scale the service, scale the team, and improve the core parts of the existing iPhone app. One of the most remarkable things about Instagram is that they’ve achieved such success while only being on one platform: iOS . There is no way to sign up on the web. No way to sign up on Android. They’re currently a mainstay in the top social networking apps list in the App Store. And that’s big because they’re not spending anything on marketing, and Apple has only promoted them a few times. In other words, the growth and traction has been largely organic. Instagram has scored some deals with partners to help promote the app. But in terms of bringing in revenue, “We’re much more interested at growing the ecosystem right now,” Systrom says. And they have plenty of money in the bank from nice funding round this past February to continue growing for some time. He also says that they have a lot more work to do on the current iPhone app. “Lots of very cool new stuff coming soon,” is all he’ll vaguely say. Though I did get him to admit that yes, more filters, are in the works. He also says there will be some “fundamental shifts in the underlying technology,” coming soon. “We want to give people the tools to tell the story of their lives in a visual way — we’re working hard on making those tools top-notch,” Systrom says. Giving their size and the rate at which they’re growing, Instagram clearly has a lot of competitors gunning for them. So far, most have failed to gain any meaningful traction. But Twitter just recently put themselves in the photo-sharing game in partnership with Photobucket. Given that Twitter is such an important social discovery mechanism for Instagram, does this worry Systrom? “I’m excited to see how a more first-class experience of photos on Twitter will allow people to have a better Instagram experience within Twitter,” he says. In other words, he think the rising tide will boost all boats, including his. There are also a number of apps popping up that are attempting to be the “Instagram of video”. That’s interesting since Instagram does not currently support the sharing of videos — might they move in that direction? “I still think it’s early — mobile video will always be slower to download and consume than photos,” Systrom notes. “Instagram is about fast, beautiful experiences. Short snippets of friends’ lives,” he continues. At the same time, “video is something that I think fits naturally into our roadmap — just not at the moment,” Systrom says. Earlier, I alluded to the fact (with math!) that despite their size, Instagram still has only four employees. That’s insane. “Hiring great people is a top priority for me right now,” Systrom says. “We clearly have something special, and we want to make sure to have the best of the best to help us to the opportunity,” he continues. But they’re not going to rush. “The thing we don’t want to do is to hire just because we’re big. Building a company is about building a product, but it’s also about building a team. They’re both very important to us,” he says. Given that Instagram is still iOS-only, surely they must have some thoughts about the just-announced iOS 5. “iOS5 provides some really awesome new tools for Instagram users. Twitter integration makes it easier than ever for users to share their photos with their followers,” Systrom says. Since they have no need for DM access, Instagram should be one of the key apps helped by the new, deep iOS Twitter integration. It’s pretty well known as this point that Apple executive Phil Schiller is a big time user of Instagram. But we’ve heard other Apple executives are hooked on the service too — though more under the radar. “It’s not surprising that notification demos featured Instagram — we send over 10 million Push Notifications per day,” Systrom says. “And I think having a home for all those pushes to be out of the way and usefully grouped makes total sense,” he says of the new notifications system in iOS 5. As for Apple’s new Photostream feature (which shares pictures you take on your devices automatically with your other devices over iCloud), “Photostream is really awesome. I think there was a big focus on unity between your Apple devices this year. So it totally makes sense for photos to sync between devices,” Systrom says. “I’d imagine photos you take with Instagram will get sync’d as well, but I’m unaware of exactly how it works,” he continues. Assuming that Instagram’s huge growth keeps up, they could very well hit 6 million users before the end of June. And 10 million before the end of the year looks like a shoo-in. And none of that is taking into account the possibility of an Android app before the end of the year. Let’s just hope Instagram finds a fifth employee before then.